If you are not already familiar with the company, SK Telecom (NYSE: SKM) is the largest wireless telecom provider in South Korea at roughly 50% market share, which compares very favorably to Verizon’s 30% market share here in the United States. Unlike Verizon, however, SK Telecom has a stronger balance sheet, a far cheaper valuation with a P/E ratio at just seven times, and a major investment in SK Hynix, one of the leading semiconductor memory companies in the world. Unlike many Korean stocks, U.S. investors can buy SK Telecom directly through the company’s ADR shares which trade on the NYSE. There are four good reasons to invest in SK Telecom which, in my view, is currently the cheapest wireless telecom company in the world. Reason #1: SK Telecom has a nearly unassailable position as the market leader in wireless telecom in South Korea. SK Telecom’s wireless business represents 90% of company revenues. The company enjoys a 50% market share of South Korea’s wireless industry, versus 30% for KT Corporation and 20% for LG Uplus Corporation. The wireless telecom industry is highly regulated in South Korea, which limits SK Telecom’s ability to increase its market share but also reduces the risk of SK Telecom losing market share. With limited competition in a regulated industry, SK Telecom currently generates 8-10% operating margins. In comparison, Verizon’s operating margins are approximately double that of SK Telecom, which provides a lot of room for improvement. This business is very utility-like, which makes its revenues, earnings and cash flows somewhat defensive. Reason #2: SK Telecom owns a 21% position in SK Hynix, which is arguably the cheapest semiconductor company in the world. As recently as 2011, SK Telecom was simply a wireless company with excess cash on its balance sheet. The company invested $3 billion in SK Hynix in 2011, and today that stake is worth more than $11 billion, representing the majority of SK Telecom’s market capitalization. SK Hynix generated 55% revenue growth, 68% EBITDA growth and 75% net income growth in the most recent quarter. The company’s strong results were driven by high DRAM prices and reduced NAND memory production costs. In the most recent quarter, SK Hynix delivered more than 75% of SK Telecom’s earnings per share. Moreover, there’s little reason for SK Hynix’s strong fundamentals to change anytime soon. Demand for semiconductor memory is exploding, driven by the growth of data centers, Internet of Things, autonomous cars and more. Also, because the semiconductor industry has consolidated over the past two decades, particularly with respect to DRAM, the competitive environment has become far more rational. SK Hynix competes with only two other major DRAM producers and five other major NAND producers. Finally, despite the massive growth in the last few years, the valuation of SK Hynix is incredibly undemanding. Its shares trade at a 3.9x P/E ratio, a 2.7x EV/EBITDA ratio and a 1.7x Price/Book ratio. Reason #3: Summing up the value of the various parts of SK Telecom’s business, its fair value is likely more than 100% greater than the current share price. Besides the company’s investment in SK Hynix, SK Telecom has other investments valued at $368 million, cash of $2 billion and outstanding debt of $5.9 billion. All together, let’s call it $3.5 billion of net debt without considering the company’s SK Hynix investment. The company’s SK Hynix stake is currently worth $11.8 billion, but this stake seems severely undervalued. If SK Hynix and the company’s wireless business were to trade at a still-undemanding EV/EBITDA ratio of 4x, the company’s SK Hynix investment would be worth $21.8 billion and the wireless business would be worth $16.8 billion. 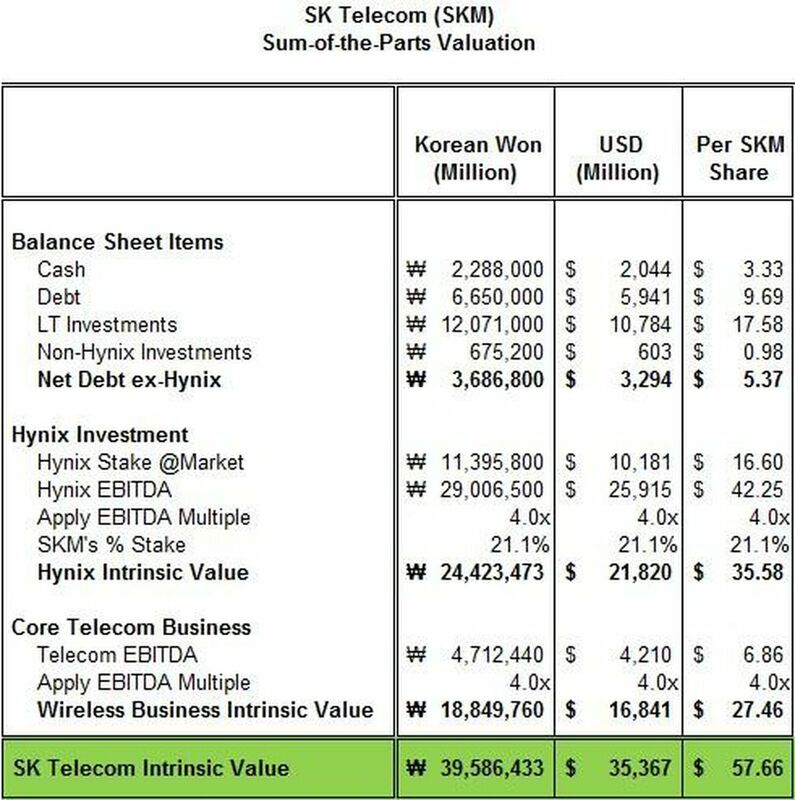 Including the value of the wireless business, its SK Hynix stake and the value of the company’s net debt, SK Telecom’s intrinsic value could be as high as $35 billion, or $57 per share (see table below). That’s more than double the current share price. As an aside, the share count in SK Telecom’s most recent filing is 80.7 million shares. However, SK Telecom itself owns 12.6 million of these shares. Essentially, the company repurchased these 12.6 million shares many years ago, but they did not retire them. Earnings and dividends are shared only across the shares outstanding outside the company’s Treasury, so the real share count is approximately 68.2 million shares. Reason #4: While you wait for Mr. Market to recognize SK Telecom’s full value, the company pays investors a healthy dividend. Like Verizon and AT&T, SK Telecom pays out a good portion of its earnings in dividends. At the current share price, SK Telecom generates a dividend yield of 3.1%, which is well above the dividend yield of the S&P 500 Index. Moreover, this dividend is after foreign withholding taxes. Risks: As with any stock, many things could go wrong, but it seems like the share price, trading at a P/E ratio of just seven times, already discounts a fairly dire future for SK Telecom and SK Hynix. Nevertheless, investing in SK Telecom involves technology risk, capital allocation risk, currency risk, regulatory risk and of course market risk. There’s a lot to like about the business, balance sheet, and valuation of SK Telecom. For a large-cap company, SK Telecom looks remarkably interesting and undervalued.